I promised some weeks ago to my Facebook readers that I will translate or post a summary of that article about Santa Claus and Father Frost. So since I am not too busy now I decided to fulfill my promise and so here is the summary + a couple added little details found in Wikipedia (as usual, I couldn't just translate the story, I had to make my own little investigation). Here's how the figures of Ded Moroz and Santa Claus might have appeared. 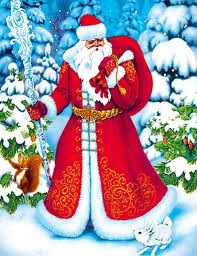 Ded Moroz (=Father Frost) appeared long-long ago. At that time Russia was still a pagan country, and the people believed that the spirits of the dead kept them safe, made the weather nicer and also made sure their animals had healthy babies. So every winter people would dress in weird clothes and give sacrifices/presents to the spirits. One of those people would be the most scary one, and he also wouldn't be allowed to speak. Everybody would call him "Ded" (=Grandfather). He might be a type of Ded Moroz. Today he is a lot kinder and doesn't expect presents, but gives them to kids. 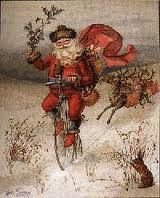 The other theory is that the "great-grand-father" of Ded Moroz is Morozko, or Moroz. He was a small old man with a long beard and really bad character. His wife was called Winter (Zima), and she was even meaner than her husband. and he always has a staff. It's hard to say where he lives because there are many legends about that, and all of them contradict one another. 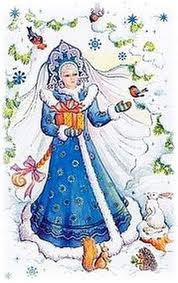 A little later there appeared Snow Maiden (Snegurochka). It's a girl made of snow, Ded Moroz's granddaughter. That what makes this Russian legend different from the European and American mythology. Have you ever heard about Santa's granddaughter? How did Santa Claus appear? 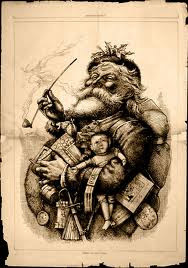 Santa Claus was first described by Clement Clarke Moore in his poem "A Visit from St. Nicholas". There he is described as a kind elf. The first Christmas card with Santa Claus wearing a red suit was made by Louis Prang in 1885. And in 1930 the Coca-Cola Company decided to use Santa's image in their advertising campaigns. That's how Santa got his red and white garments. Plus he wasn't an elf any more, but he turned into a giant! Who was St. Nicholas then? Well, he lived in the 4th century A.D in Greece. St. Nicholas was rich, so he used his wealth to help the needy. The legend says that once he learnt about a poor family where the three daughters would probably have to become prostitutes because their father didn't have enough money to support them and so he was thinking about selling them. So Saint Nicholas went to his house under the cover of night and threw three purses (one for each daughter) filled with gold coins through the window opening into the man's house. And he continued doing that on Christmas eve every year until the family had enough money for the girls to get married. 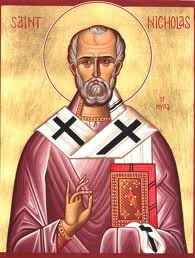 However Saint Nicholas is famous not only for his kindness and charitable deeds, but also for his miracles. He loved children and often helped them and is even believed to have resurrected some of them from the dead. So on St. Nicholas day children usually get presents. Plus St. Nicholas lived in Greece where there's hardly any snow in winter, so he really didn't need all those warm clothes. So, as you see, both Ded Moroz and Santa Claus have little in common with St. Nicholas. They are most probably a result of several legends mixed together. The only character thing they have in common is their love for children and gifts that they give out to kids. I have to admit that at first I felt a little disappointed with the fact that it's not a Christian tradition. But it's still a very good one. My daughter believes in Ded Moroz with all her little heart. And my husband and I are doing everything to keep this belief alive until she grows up and learns to love the miracle of Christmas and New Year even though Ded Moroz/Santa Claus is just a legend. It's even better this way, because it means that WE can make a fairy tale come true and make the little ones feel special, and we can point to the ONE who has already given the greatest gift to all of us. Have you changed since you became a freelancer?